Our Helmet Stands are a stately, elegant way to properly display your favorite helmet on your mantle, bookshelf or cabinet. The stands will Handsomely accommodate any size helmet from Comb Morians to Great Helms to Military Helmets. Some Wooden helmet stands have beautifully turned hardwood posts and sturdy round, beveled bases. Others are simple in design but are just as sturdy. We even have Styrofoam heads, that are molded in a skin tone colored foam with slight facial features for a realistic appearance. Our adjustable hat stand and stretcher is a great way to display all types of military field caps. Made in the USA, these wooden stands feature an adjustable wooden form, felt padding and legs. Our Hardwood Helmet Stand is a stately, elegant way to display your favorite helmet on your mantle, bookshelf or cabinet. Handsomely accommodates any size helmet from Morians to Great Helms to Military Helmets. 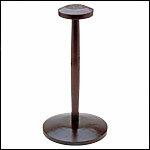 Beautifully turned hardwood post has sturdy round, beveled base. This Helmet Stand is sized to display and provide adequate support for all of our full size helmets. Approximately 17 inches tall. This helmet stand, made from wood, is sized to display and provide adequate support for all of our full size helmets. Black lacquer finish, wood construction, and a square base. Styrofoam Hat/Helmet Stand. Foam heads are a great way to display all types of headwear. Made from Styrofoam these are molded in a skin tone colored foam with slight facial features for a realistic appearance. Our Wooden Helmet Stand is a splendid, stylish way to display your favorite helmet on your mantle, bookshelf or desk. Made from a decorative hardwood. Approximately 17 inches tall and will accommodate most helmets.